Recent PhD graduate Erich Petushek (CLS; MSU College of Human Medicine), Associate Professor Edward Cokely (CLS), Assistant Professor John Durocher (Bio Sci), Paul Ward (University of Huddersfield, UK), Sean Wallace (Illinois Institute of Technology) and Gregory Myer (Cincinnati Children’s Hospital Medical Center) published the paper “Injury Risk Estimation Expertise: Assessing the ACL Injury Risk Estimation Quiz,” in The American Journal of Sports Medicine, 2015 43: 1640-1647. Registration for the End of Summer Science Camp is open until Aug. 24. Camps take place from 9 a.m. to 4 p.m. Sept. 1-3. 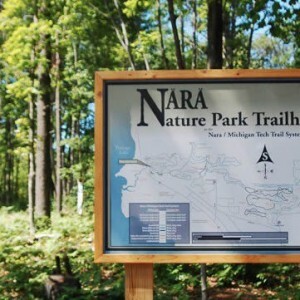 Enjoy time outdoors at the Nara Nature Center exploring trails, wildlife and plants. Make nature observations, play games and do nature crafts as a fun way to end summer vacation. Drop off at the Nara Nature Center. This group will spend the 1st day at the Great Lakes Research Center engaged in forays around campus. On Day 2 & 3, they’ll explore the Keweenaw Land Trust’s Marsin Nature Area with bug, wildlife and aquatic experts. There will be time to play games, read stories, write poetry, daydream and record observations in journals. Weather permitting, there will be water activities. Drop off at the Great Lakes Research Center. A Michigan Tech van will transport students to Marsin Center on Wednesday and Thursday. Please note on the registration form if you will drop off your student at the Nara Nature Center at 9:30 a.m. and pick up at 3:30 p.m. The number attending is limited to 20 students for Grades 1-3, and 15 students for Grades 4-6. Cost is $135 per student and attendees must bring their own lunch. You can register online or by contacting wupcenter@mtu.edu. For more information, call 7-3341. From Tech Today, by Center for Science and Environmental Outreach at Great Lakes Research Center.